If you have more than one hedgehog and when they are together you notice them biting each other’s quills, this may be a pre-cursor to anointing or a fight. One might also notice biting accompanied by singing during the mating process. This is common in many animal species and not to be of much concern. Hedgehogs CAN bite and injure each other. 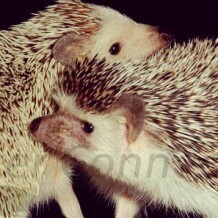 Ear and leg injuries can easily happen when two hedgehogs are trying to establish territories. In conclusion bites do not happen that frequently, but you should be prepared in the event that it does. Hedgehogs are insectivores with small teeth and small incisors when compared to rodents. Hedgehogs will not damage furniture or wood trim by chewing, nor are they likely to gnaw through fabric, cords or wires. Hedgehogs will go through a teething process as babies, but they do not have the need to chew and destroy objects like a puppy or dog. Redirecting hedgehogs away from items or simply removing items that they shouldn’t chew is much better than scolding a hedgehog or trying to train it to not chew something in its environment.